If your kiddos are anything like mine, you’ve seen the chaos that is getting dressed in the morning. Clothes fly everywhere and all of the neat, tidy stacks of folded laundry end up in a jumbled, crumbled, wrinkled mess. Here’s a secret about me: I HATE folding laundry. It is my least favorite chore. A close second is finding something clean, mostly stain and hole free, and somewhat coordinated for the Tiny Human to wear to school. I figured out a way to solve both problems in one fell swoop: Draw labels and dividers. Because my Tiny Human is an emerging reader, the pictures help him remember and learn the words. When I made this, he would look for the R2D2 and now he knows that it says “Monday”. It’s just another way that I can make his room a print-rich environment. 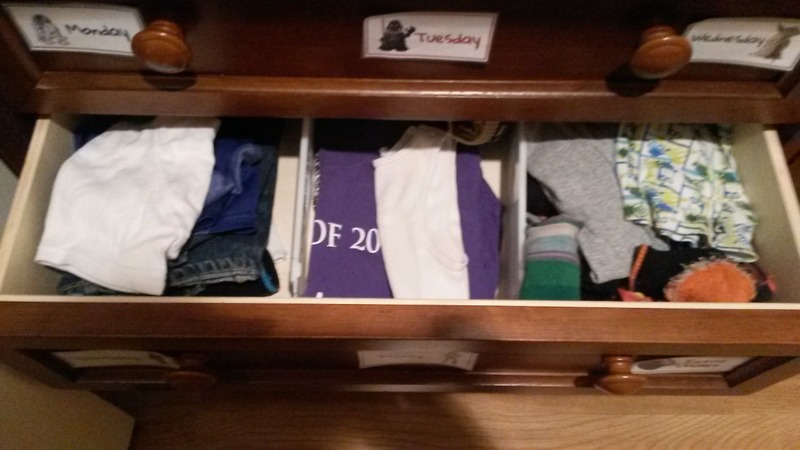 I cut out the labels, laminated them, cut them out again, and taped them to his drawers. I stopped by the store and got some drawer dividers (here are some on Amazon) and split the first two drawers into three sections. I put one complete school-appropriate outfit in each section and then trained the Tiny Human to put away his own laundry (okay, it’s a work in progress…). 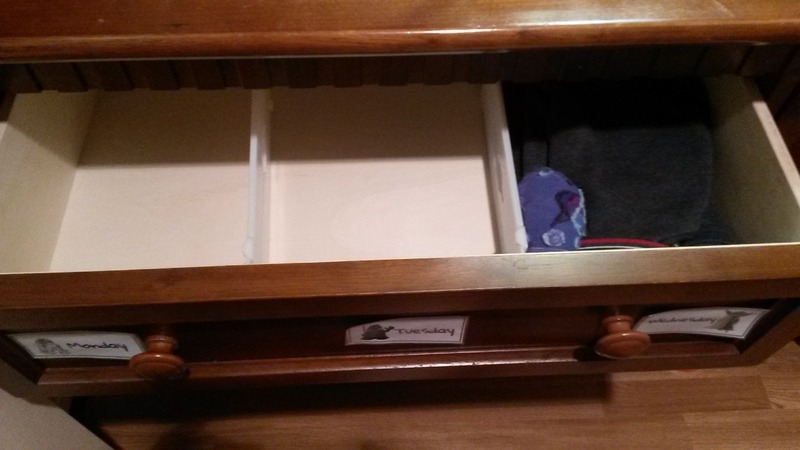 The bottom drawer is all play clothes–anything that has stains (paint, marker, unidentified mess) or holes goes there until I toss it or re-purpose it. I’m happy to report that the system is working and we’re all much calmer in the mornings! 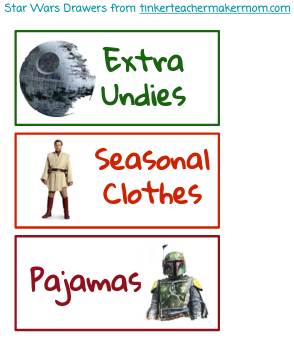 Make your own labels by downloading the PDF StarWarsDrawers or the editable PowerPoint StarWarsDrawers!